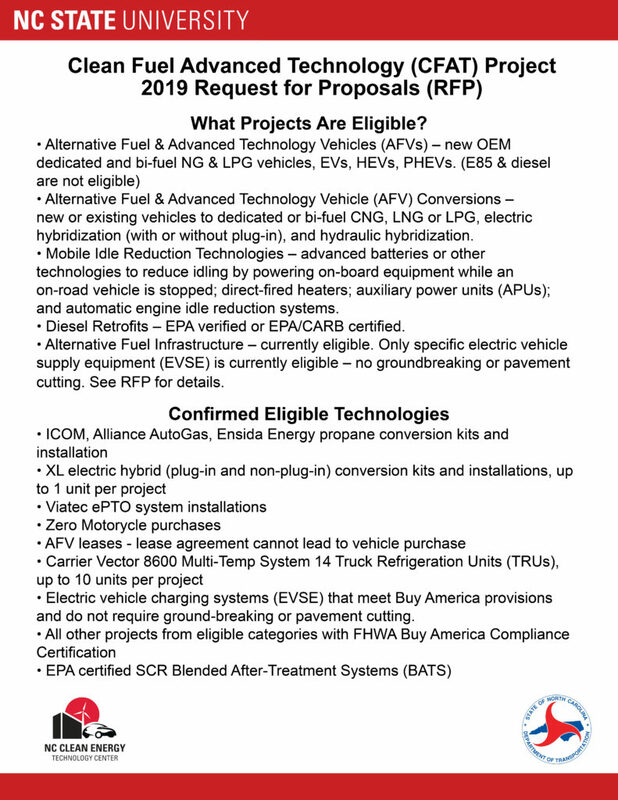 The North Carolina Clean Energy Technology Center (NCCETC) announces the following request for proposal (RFP) through the 2019 Clean Fuel Advanced Technology (CFAT) project. The CFAT project is supported with federal Congestion Mitigation Air Quality (CMAQ) funds provided by the NC Department of Transportation (NC DOT). The primary purpose of the CFAT project is to reduce transportation-related emissions in 24 eligible North Carolina counties. Click here to learn more about 2019 CFAT with a webinar video. The N.C. Clean Energy Technology Center (NCCETC) at N.C. State University announced the results of a call for projects through the CFAT Project. The 2017-2018 $5.6 million initiative, focused on reducing transportation-related emissions, is supported with federal Congestion Mitigation Air Quality funding from the N.C. Department of Transportation (DOT). More than $1,100,101 is being awarded for ten projects to a variety of public and private entities.